When you are ready to buy your first home you may be wondering about the entire process. It is a big responsibility to take on a mortgage and the care of a home. 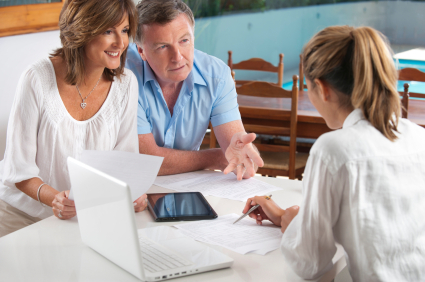 You need to be prepared to go through a lengthy loan process. You should also work with a realtor and mortgage officer who are willing to answer any questions you have along the way. It is exciting to buy your first home, but you still may have a wide variety of questions about purchasing your home. You can prepare to go through the process by learning the answers to many of your questions. Many first time homebuyers may be confused about the process of applying for their first mortgage. You may be wondering what it means to be preapproved and how to determine how much you can afford to borrow to purchase your home. Before you go house hunting you may want to contact a mortgage company to see if you qualify for a loan. If you do, they will preapprove you for up to a certain amount of money. You will still need to process the loan once you sign the papers, but the preapproval can let you go shopping with confidence. You can determine the amount you can afford to borrow by breaking down the monthly mortgage payments including taxes and fees. Your monthly payment should not be more than twenty-five percent of your monthly income. Once you put in the offer on the home, your loan will be processed for you. Many first time homebuyers worry about mortgages. They may wonder if they should choose an adjustable rate mortgage (ARM) or a traditional fixed rate mortgage. They may also be wondering about points, closing fees and closing on the loan. An ARM offers a lower initial interest rate, but it will go up over time. It is often safer to choose a traditional mortgage even with a higher interest rate. Closing fees are the costs associated with taking out the loan. Some companies will roll the closing costs into the mortgage while others require you to pay up front. You should plan on having around $5,000 set aside to cover closing costs. You can purchase points when you take out a mortgage. It is like prepaying the interest. You pay the money up front, and the points can reduce your interest rate. If you want to purchase points you need to have money set aside to cover them when you take out the loan. Many first time homebuyers also wonder about moving expenses. The amount you spend is up to you. Some people will hire professional movers while others will ask friends for help. The moving costs can be kept down if you are willing to do the work. Credit issues may be a concern for many first time homebuyers. Your credit report and score will determine if you qualify for a loan and the interest rate you are charged on the mortgage. You can clean up past mistakes before taking out a mortgage. Make sure your bills are current and try to pay down the balances on your credit cards before you apply for a mortgage. This should help you resolve your credit issues. Since you are taking on the responsibility of a home, you are now responsible for the cost of any repairs and improvements you make to the home. You should plan on an emergency fund to cover these costs. You also need to make sure you are setting aside money for home insurance, taxes, and home association fees. Common Questions from First Time Home Buyers: HUD answers some common questions that many home buyers ask before buying their first home. Before Buying Your First Home: This guide explains the entire home buying process for a first time homeowner. Mortgages for Buyers and Homeowners: This article explains how to shop for a mortgage. Buying Your First Home: This article talks about the home buying process and the responsibilities you take on by being a homeowner. Finances and Buying a House: This CNN article will guide you through getting your finances in order so that you can qualify for your first mortgage. Ten Tips for Buying Your First Home: This article gives you ten tips that will help you throughout the entire home buying process. Buying a New or Existing Property: This guide compares the pros and cons of buying new homes versus existing properties.